One of the characteristics of the Japanese people is their delicate workmanship together with an abundance of motifs that personify the versatility of their traditional arts. 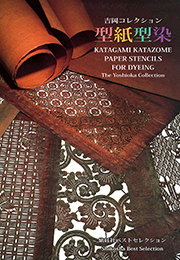 Patterns are cut in two sizes, tiny komon and medium chugata, that contain most of the traditional motifs in Japan : flowers, animals, birds, scenery, geometric patterns and scenes from old folk tales. Copyright(c) atmarkcreate CO.LTD All Right Reserved.